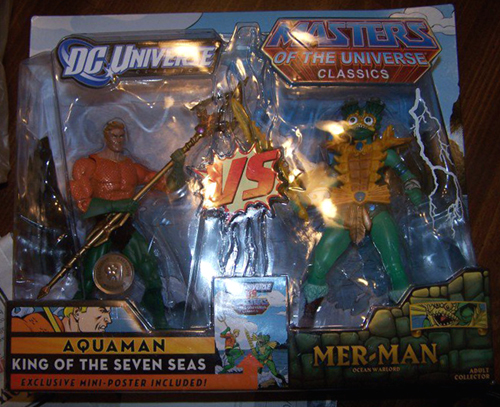 Not to steal a bit from Poe Ghostal, but this swapped-out Aquaman vs. Mer-Man two-pack posted on Matty Collector's Facebook was too good not to re-post. One Eternian embezzler wanted this set's exclusive blue Mer-Man so much that he gave up the body of his Goddess figure as well as his regular Mer-Man's alternate head to get it. The result, although both illegal and generally scummy, is sort of hilarious. I like to think that for every swapped-out set like this, there's a Toys "R" Us exclusive Ghostbusters 2 four-pack that someone returned with the tan-suited Ghostbusters in place of the normal gray versions. It's also worth noting that this photo was clearly not taken inside a Toys "R" Us. Perhaps the original poster preferred this alternate pairing.